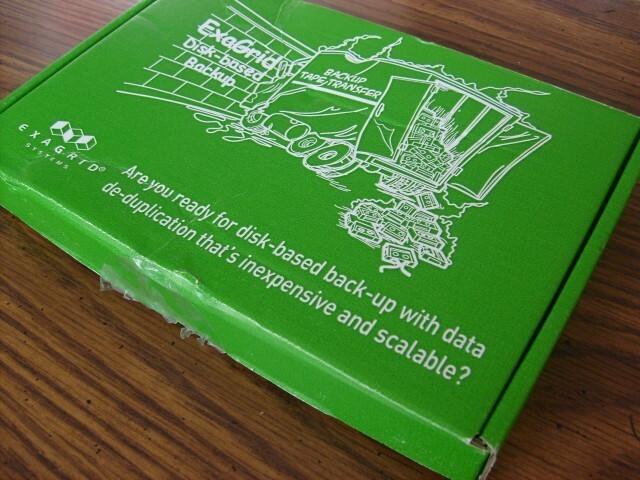 Well, the other day I got a package in from ExaGrid Systems, for their disk-based backup solution. Normally, you can get crap-loads of this stuff every day. Usually, you get the standard window envelope addressed to the systems or network administrator. This will include a short white paper talking about how great their product is, and then a little ad letter or reply card with a URL to go to for more information. Just the standard stuff. Now, the package I got from ExaGrid promised so much more. How? Not because the packaging actually promised anything, but the package it came it screamed schwag! Note: I have come to use the term schwag to refer to promotional items given away by companies, usually at conferences or other gatherings, where Wiki defines schwag as referring to low-grade marijuana while promotional items are swag. I have linked to their swag definition, but I will still call it schwag. Now, this box said a flash-based thumb-drive, cool pens, or at least a lanyard, something… anything with the company’s name and logo. Here, look at the box and tell me that it doesn’t screen iPod Nano! Did you see it? 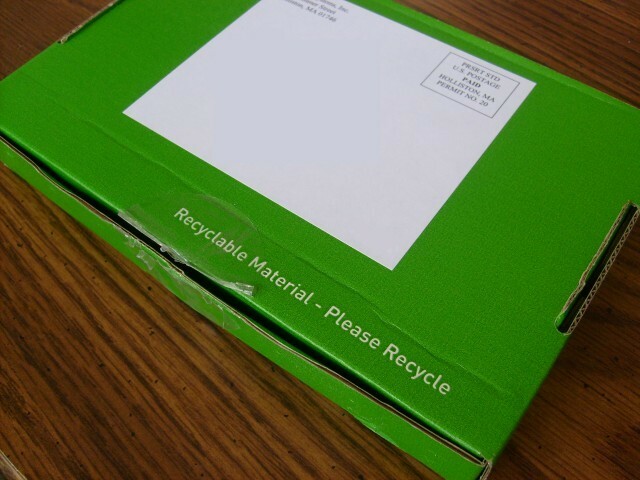 Yes, they are environmentally “thoughtful” that they included a little notice that the packing was recyclable. That was nice, at least they didn’t ship whatever it is in a plastic box or something not as recyclable as cardboard. Yeah, that was it. Just a product info card. Hell, not even that. 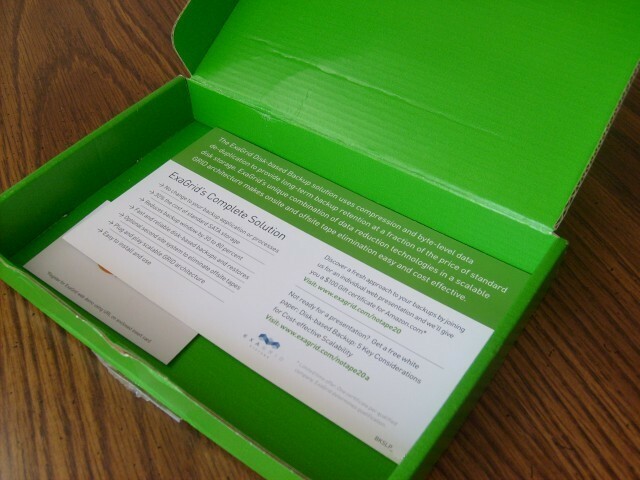 It’s a one-sided card that mentions their software, the online presentation and white paper. Beneath that, was an Amazon logo on a business card that said to register for the web demo at the URL on the “enclosed insert card.” Oh, the insert card did say you could register to win a $100 gift certificate from Amazon.com. So, I am just wondering, but couldn’t ExaGrid done a better job for the environment by just sending a post-card, or an envelope with the info card inside? Thanks ExaGrid, but I think you missed the point.